Steam Laundry is a novel in poems based on the true story of Sarah Ellen Gibson, a miner’s wife during the Klondike and Alaska gold rushes. Her journey began as she followed her husband to Dawson City, Yukon Territory in 1898. She stayed there three years as the town’s boom and her marriage burned out. In 1903, she left her husband and sons to start over in Fairbanks, Alaska with another man. Based on archival research and incorporating historical documents and photographs, the poems approach the past through the ghosts of correspondence. The poems, written in the voices of Gibson, her family members, and the people who knew her, take on love, loss, failure, and desire. Some confront the drama of failed marriages, troubled family relationships, and alcoholism. Others spin the dramatic details of hunting accidents and subarctic survival into compelling stories in verse. They embody the opposing voices of an era during which men and women struggled in different, but overlapping, universes. By staring at Gibson through the spectral lenses of the people around her, the documents she left behind, and the vision of a contemporary poet, the particulars of Gibson’s life are transformed into an exploration of the people history usually forgets. 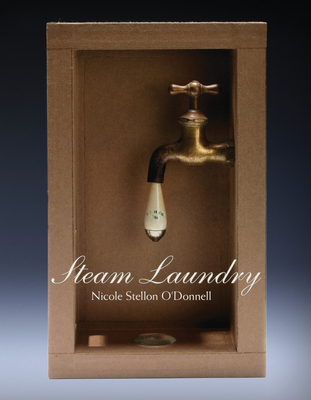 Steam Laundry offers the reader the chance to try on the dusty, mining-town overcoat of Gibson’s life. Nicole Stellon O Donnell was born and raised on Chicago s South Side. She earned a BA in Philosophy and Literary Studies from Beloit College. She worked as a programming intern at The Loft in Minneapolis before moving to Alaska, where she earned her MFA from the University of Alaska, Fairbanks.Her poems have appeared in Prairie Schooner, Beloit Poetry Journal, The Women s Review of Books, Ice Floe, Cirque, and other literary journals. Her essays about berry picking and dipnetting have appeared in the Anchorage Daily News, and she has written commentaries for the Alaska Public Radio Network on a range of topics, including fashion, a family murder story, and whether or not the World Series is an emergency worthy of a last-minute flight from Alaska.She is a former poetry editor for Permafrost, and since 2007, she has worked as a columns editor for Literary Mama, a journal for the maternally inclined. She teaches creative writing and has been recognized with a BP Teacher of Excellence Award for her work in the classroom. She has organized readings and literary events in Anchorage, Fairbanks, and Togiak.While working on Steam Laundry, she received an Individual Artist Project Award from the Rasmuson Foundation to support her writing and research. Part of that grant helped fund babysitting for her two daughters, Cedar and Coral, so that she could get into the archives, slip on white gloves, and unfold the hundred-year-old letters that came to inform the poems. She still likes reading other people s mail."